For Dental Emergency, call us on (02) 9365 7187 for immediate attention or complete the web form below. Conveniently located in the Eastern Suburbs and with free parking facilities, Bondi Dental offers emergency dental services by our experienced dentists even after office hours, during weekends (Saturdays and Sundays), and on all Public Holidays. Bondi Dental is here to assist you with dental emergencies 24 hours per day, 7 days per week in our modern, comfortable, and professional dental centre. Bondi Dental is here to assist you with dental emergencies 24 hours per day, 7 days per week in our modern, comfortable, and professional dental centre. 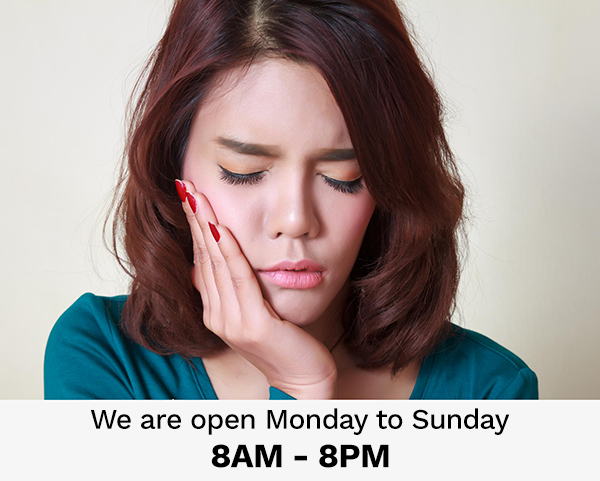 Our dental clinic is open from Mondays to Sundays, 8:00AM to 8:00PM. We offer a comprehensive range of dental emergency services and can address any types of dental emergency cases, from intense toothache, to knocked-out tooth and damaged dental appliances. We are comprised of highly skilled and responsive dental team. We can provide the best possible care to make you pain-free and at ease again.